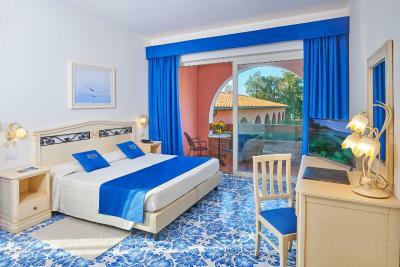 Lock in a great price for Hotel Del Golfo – rated 9.3 by recent guests! The beach was perfect, especially on an island known for rocky and rock beaches. Soft sand and nice lounges with umbrellas. Staff was very friendly and helpful, beautiful room and very clean. Breakfast was fabulous and in lovely setting overlooking the sea. Dinner was beautifully presented and staff very attentive. The entire resort was super clean and well cared for. Fantastic property with great location and super-friendly staff. We had room+breakfast but I would recommend the option with dinner included. Dinner is 4-course meal with multiple choices per course and it is fine and sophisticated. We paid for it extra on both nights we were there but it is probably a better deal to include it in the daily rate. 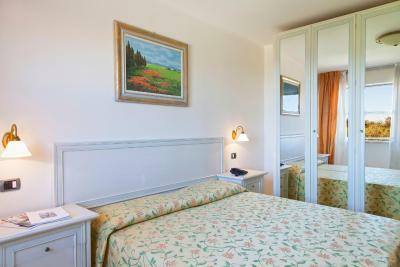 We liked the size of the room, the comfortable bed and the cleanliness of the area. This is a 5 not a 4 star hotel. It delivers a traditional style of relaxed formality the likes of which I hadn't experienced in a European beach hotel in decades. All the staff are charming and impeccably turned out, and as helpful with elder guests as they are friendly to children (we were a party of both). Food and Beverage exceeded expectations and dinner in the formal dining room (long trousers for chaps encouraged) is a proper gastronomic experience. Pool and sports facilities first class and the private beach is well organised and spotlessly clean. Procchio is a nice sandy bay though the beaches on the south of the island have clearer water when the winds are northerly, the case during our stay. Elba is tiny though, so one can be anywhere in a 15 minute drive. Thoroughly recommended. Everything exceeded the expectations expected the fact that in the reservation was for a seas side view room and the we got a garden view with to it is a minor detail. The acomodation is very good, the location is perfect for a beach holidays and the food is very good particularly at dinner time. Very Beautiful Property and a we had the most beautiful sea facing suite! Loved the exclusive beach and the food - both at the beach restaurant and at the buffet dinner ! They had sufficient vegan options as well. The staff was very efficient, courteous and helpful! A lovely location with excellent views and peaceful surroundings. Generally the staff were very polite and helpful. The hotel has an excellent location and a beautiful beach. The rooms are located across the main and several other buildings which are very close to each other but the entire property feels very spacious at the same time. The breakfast is superb (with a sea view), the rooms are super-clean, the bathroom super-luxurious and the staff is super-friendly. The location. The beautiful beach with crystalline water, the umbrellas and chairs. The view from the rooms. 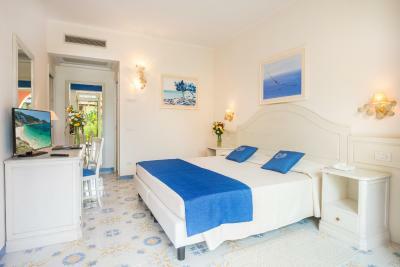 The attractive decoration, comfortable beds and large bathrooms. The delicious breakfast in a beautiful setting. We were here in this hotel second time. Like the first time eveything was perfect. Very nice and friendly staff, and the food was amazing. We are looking foward the next time to stay here. 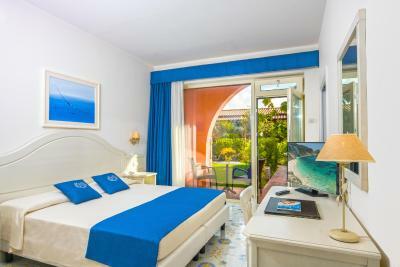 Hotel Del Golfo This rating is a reflection of how the property compares to the industry standard when it comes to price, facilities and services available. It's based on a self-evaluation by the property. Use this rating to help choose your stay! One of our top picks in Procchio – and a guest favorite. Accommodations are spread over villas in the gardens, or rooms in the main building. 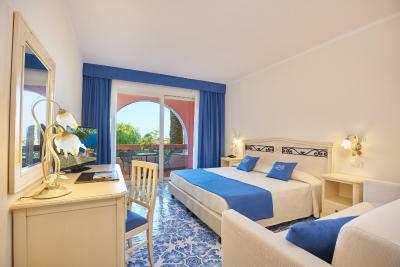 Rooms are spacious and bright, and each has free wired internet, air conditioning, and Acqua dell'Elba toiletries. 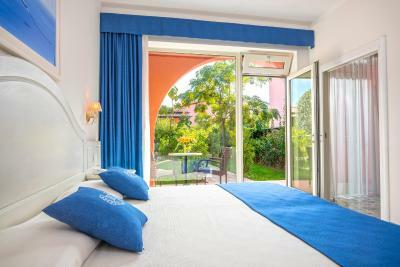 All rooms have a private balcony or patio. 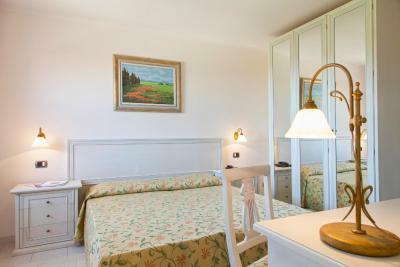 The hotel is surrounded by the beautiful pine woods, typical of Elba Island. The restaurant serves top-quality Italian cuisine, along with local specialties and excellent Tuscan wines. 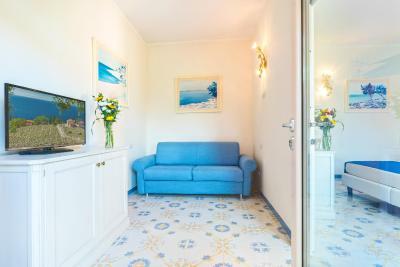 Sports facilities at Del Golfo Hotel include tennis and football courts. Bicycles are available at the front desk, and during summer there is a mini club for children. 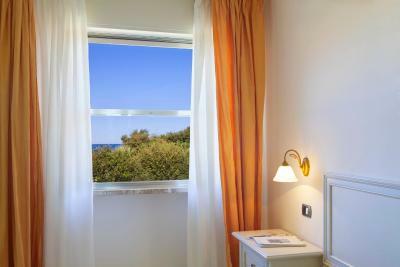 The hotel can organize boat trips, trekking in the surrounding area, visits of the local vineyard, and shopping tours. Parking is free. This property also has one of the top-rated locations in Procchio! Guests are happier about it compared to other properties in the area. 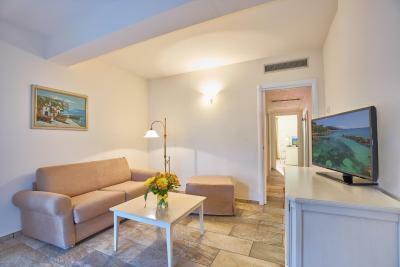 This property is also rated for the best value in Procchio! Guests are getting more for their money when compared to other properties in this city. 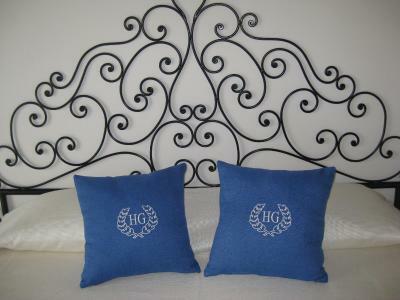 When would you like to stay at Hotel Del Golfo? 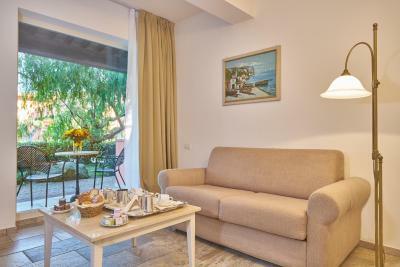 Located in the villas, these rooms can be on groundfloor or on the first floor and offer patio or balcony. 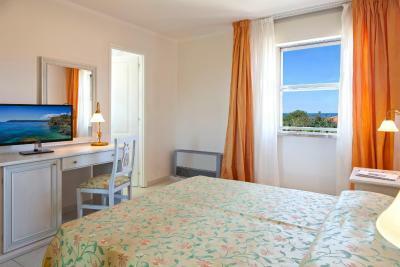 In the villas on the grounds, these rooms have a patio or a balcony full views of the sea. Free Wi-Fi is available. 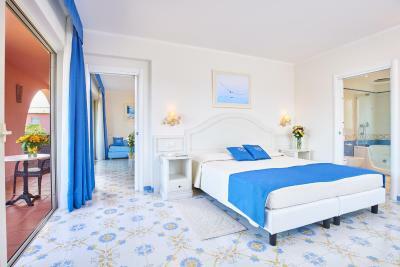 In the main building, the spacious suites offer a living area and a sea-view balcony or a patio. 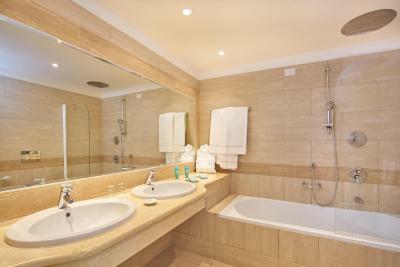 The bathroom features a spa tub. Free Wi-Fi is available, as well as 2 satellite TVs. In the main building or in the villas, these rooms have a balcony or a patio. Free Wi-Fi is available. 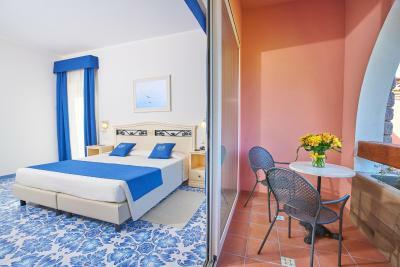 House Rules Hotel Del Golfo takes special requests – add in the next step! All children under 2 years are charged EUR 55 per night in a crib. Hotel Del Golfo accepts these cards and reserves the right to temporarily hold an amount prior to arrival. Hotel del Golfo’s mini club is available for children from 4 to 12 years old from June 15 to September 7. Please note that the half-board option covers breakfast and dinner. We missed a mosquito window in our room. We could not sleep well either because of the noise from the air condition or, withour air condition and with open window, because of the noise from several waste coolers close to the guest house. The beach facilities are very comfortable but the quality of the seawater was poor. 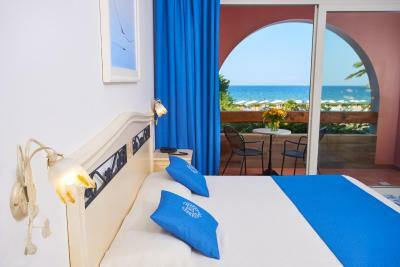 Has said before everything was perfect and I would quote this hotel 10 if at the checkout, after expressing how much i liked the hotel despite the small detail, the lady in charge did not tell me that I was wrong and my room was sea side view. I asked her to come with me to show me the sea from my room and she explained that it was a question room description at booking.com. Instead of accepting that they have a wrong room description that for some customers it can be a problem ( witch is not my case) She tried to convinced that I was the one that was wrong making that comment. This happened on the night of the August 10th when I did the payment of the one week stay and I left very early morning on the 11th. As a summary the hotel wold get a 10 if there wasn't the "non sense argumentation" at the end. A designated area for smoking in the restaurant area. A lot of people don't like smoke. The price for an upgrade to a sea view rom is unreasonable. The dinner was quite expensive. Beds and pillows were so so. Hard beds, thin lumpy pillows. Wish the dinner was not prix fixe...would have eaten there every night if we could have ordered alacarte. Restaurants nearby were awful despite decent reviews, the food from local grocery stores was great, but wish there were more options nearby since roads are dark, winding and precarious. Everything was perfect. We returned 4 times in this hotel and they gave us suite instead of normal room as extra. Very very kind. Awesome food and location, perfect summer holidays. The beach is great, beautiful garden, good service and the breakfast. We hope to come back! Unfortunately, we stayed only 3 days and didin't have a chance to try a dinner, because the restaurant was always busy for booking for dinners.